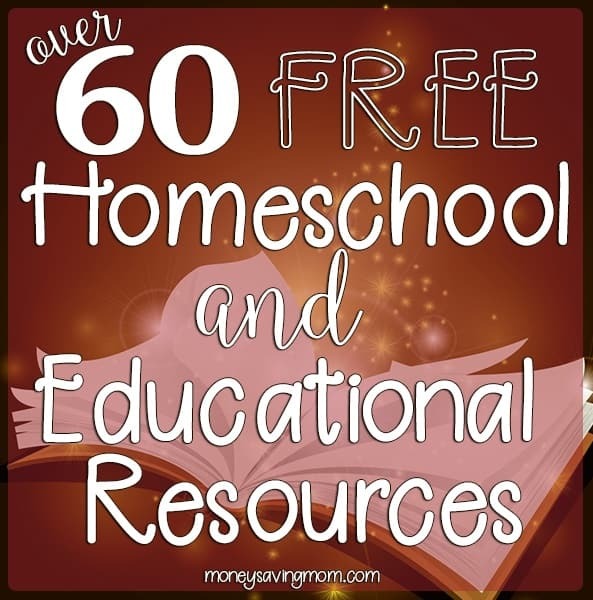 This is a weekly list of Free Homeschool Curriculum and Resources compiled by Carrie from . If you aren’t a homeschooler, but you’re a parent, teacher, babysitter, or nanny, you’ll probably find at least a few useful freebies in this list. You may also want to go through the Educational Deals and Freebies from earlier this week for more. Don’t forget to check out all of the exclusive freebies over at . – If you’d like to expose your youngster to another language, you might consider German! Here is a free, introductory German course that he can learn at home. They have other options for older students too. – If your child has ADHD, you know that this is a daily struggle. Here are some helpful tips to creating a daily checklist. – This one resource saved our homeschool from lots of tears! Use discount10 to save $10 now. – If you are a Mo Willems fan, you’re going to love these activities and crafts that highlight his fabulous children’s books. – Moms already know that it’s fun to talk about the weather with their little ones. Consider how much more fun it will be to pull out weather stones when discussing the wind, the rain, or the sunshine! – These printables would be so cute in a child’s room. Find an old frame to place it in to really make it stand out. – There are several ways to go about teaching Health and P.E. that doesn’t have to be overwhelming. – The end of the calendar year is a great time to take a moment to reflect on what is working for your daily homeschool schedule and what is not. Glance over these secrets to creating a successful homeschool week…they are basic, but so good..and start your January off on the right foot! – Cursive handwriting is quickly becoming a lost art. How will they be able to one day read our country’s founding documents? This freebie will help you teach cursive to your kids. – This is your one-stop shop for emergent readers! Emergent readers can play a huge role in learning how to read. – These free printables are going to help your student organize their ideas to get them on paper. – Rock art and crafts have been all the rage for some time, but has your homeschool made or used story stones? – You can help your child conquer the spelling rule monster by creating a spelling folder with these free printables! – Rhode Island may be the smallest state in size, but it has so much history to share. – If you’ve never been to SC, you can join us as we learn about this state with these great resources we have gathered for you. – As we say goodbye to 2017, it is important to think back to things that have happened in history leading up to this point. Test your student’s knowledge of 25 countries that have become independent within the last 100 years with this fun, FREE 8-page printable. – Explore how Christmas is celebrated around the world with this geography and mapping challenge for kids & teens! Explore how Christmas is celebrated around the world with this geography and mapping challenge for kids & teens. – If you want to teach your kids how to appreicate art and artists, this free printable art history card and activities set is great. – If you’re studying American history in your homeschool, it’s just a matter of time before the Civil War appears on the horizon. You should consider the option of doing a unit study on the Civil War since there’s so much to explore. – Study Ben Franklin together with this free unit study. It includes book suggestions, copywork, and even some online videos to watch. – You and your children can learn about the song’s history and tradition with this fantastic mini-study! Its 19 pages will bring this timeless song to life. – Some children have the hardest time discerning between the measurement of area and perimeter. This fun game will help solidify the info. – Inspire seasonal STEM learning! Explore some holiday science with this fun Christmas experiment and free printable worksheet. – These large printable cue cards can help kids remember the songs to sing the multiplication tables for 3, 4, 5, 6, 7, & 8. – LEGOs + educational-anything always = a great combination, like this earth science activity. – Kids can enjoy using their creativity in the arts and crafts to show what they have learned for just about every subject imaginable by using lapbooks. – From Pre-Primer to Second Grade this Dolch Sight Word Puzzle Cards Bundle contains over 150 Sight Word Puzzle Cards. – Children do not always have a natural ability to hold their writing instruments properly. Learn how to help your young learners. – Help keep Christ at the center of your preschooler’s Christmas with this printable preschool pack. This printable pack includes 16 activity pages including mazes, counting practice, sorting, coloring, and more. – Having a baseline idea of where your child is really helpful in measuring progress. This quick and simple phonics assessment can help you to quickly find strengths and weaknesses your child may have. – Create life-long learners and lovers of wisdom! – 14 Bible Verses to Pray Over Your Children with free printable. – These Christmas Bible Verse coloring pages from 1+1+1=1 are absolutely beautiful. They feature a beautiful detailed coloring page for little ones (and big ones) to color with a Bible verse. – Teach your kids about the 7 Days of Creation with a fun art project you’ll want to hang onto for years to come. – Are you looking for a new homeschool Bible study? This Jesus’ Parables Lapbook is perfect for homeschoolers. You will love this Biblical Calendar. Save 20% now through 12/20/17. – The beauty of Christmas is upon us, but are you burdened because you have little to no money to spend this season? That doesn’t mean that you can’t have any surprises up your sleeve! – Included are your monthly planning, shopping list, meal planning, gift list, card list, and even recipe card pages. When you download now you will also receive a FREE subscription to the Homeschool Sense Quarterly magazine. – Here’s a fun activity that boys can make with the help of mom using either a favorite car or a brand-new one. – Do your kids need a little warming up before the homeschool day begins? Download our FREE Brainy Days Warm-Ups Christmas Edition and have a full month of Christmas Brain Teaser fun! – It’s been a long time since I’ve seen a kids’ craft as cute as this one! Bring the snow indoors with this fun Paper Plate Snow Globe Craft. – Make numbers fun for your early learner with this bold Snowman Number Match Activity. – If you are looking for a fun way to keep schooling through the Christmas season, you’ll want to consider downloading this free, printable A Christmas Carol Learning Pack. – This free Christmas printables collection has 11 different resources which are Free Coloring Advent Calendars, Free Christmas Coloring Pages, and more. – Share the REAL hope behind the holiday this Christmas by telling your children of Jesus’ birth. Download your FREE copy of five Nativity coloring pages. – Homeschool moms may very likely feel that they have a higher level of concern because so much of our children’s success is tied directly to our involvement in their lives. How do you deal with your anxiety? – These free Household Organizational Printables will help you get everything from your freezer to your Bible time to your finances in order. – Teach your kids how to cook once and for all and get the hhelp in the kitchedn that you desperately need! – These small grocery stores are well-known for their fantastic prices and quality product. – Not every style works for moms, lets just admit it. However, there are some trendy items that we can incorporate into our wardrobe to at least freshen up and update our look. – Do you plan on visitors this holiday season? If yes then, now is the best time to get your pantry organized. – We love educating ourselves on how to use natural remedies. These really work! – If you are a busy mom of little ones, it seems pretty far fetched to think about our self care sometimes. This free printable will help make sure you don’t neglect yourself. – Learn how you can put your homeschool mom skills to work and earn extra money to help support your family. – Great ideas to save on utility bills. – Learn how we save $629 a month on health insurance. – DO you opt for store brands or always name brands? The results of this comparison may suprise you. – Do you love waffles? Mix it up with all of these options. – Make it yout goal to get your family eating healthy in 2018! – There are things you can get from the dollar store that can truly help keep your home organized. Find a big list of them here. – Ditch the junk and make your own! – It’s so hard to declutter sometimes, especially in the kitchen. These tips will get you started and help you whip your kitchen int shape. – Looking for a simple winter project or a homemade gift with a lot of bang for a little buck? These beautiful Flannel Throw Blankets are your ticket! – Leanr these cool tricks to organize your wrapping paper and save yourself some money next year. – If you’ve got an upcoming party, you’ll want to check out these DIY party favor gift bags. – Everyone enjoys making things at Christmas, even teenagers! You can help your teen get involved in Christmas festivities with these 50 DIY crafting ideas.